GRIN AND BARRETT: Egg Hunt Madness! The day before Easter I had the opportunity to drive up to This is the Place Heritage Park to set up and work the FM100.3 Easter Egg Hunt. As the staff and I were dispersing the eggs around the old homes, the wind began to blow and rain drops were falling from the sky. I thought no sane person would want to drive up to this park to pick up a few Easter Eggs full of Tropical Lifesavers and a Tootsie Roll. For me, at least, it wouldn't be worth it. I'd rather spend $4 on a bag of assorted candy than to go "hunting" for eggs. The rain eventually stopped and it turned out to be a pretty decent day. Hundreds of people filled Main Street, all anxious to hear the gunshot that signified the beginning of the search for the eggs. A never-ending line formed for the popcorn and hot chocolate, which I somehow was given charge to look after. After an hour of scooping hot chocolate into Styrofoam cups, I managed to relieve myself of that duty and go make sure no one was entering the egg-hunting grounds before the hunt began. I stood at the gate for the 12+ year olds. I am amazed at how aggressive parents are in such situations. 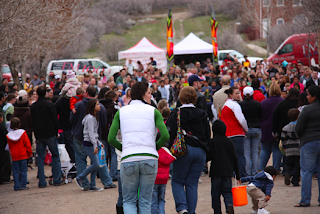 I've never had so many complaints or negative comments said to me as I did at this "family-friendly" Easter egg hunt. The children do not seem to care how many eggs they get. Normally a child would grab one and be happy for the rest of the day. When the gun sounded, however, parents stormed the fields, gathering as many of the plastic eggs as possible. It was ridiculous. After witnessing such things, I have vowed to never participate in an Easter Egg Hunt with my future children.